A cement is a binder, a substance that sets and hardens independently, and can bind other materials together. A portland cement is the most common type of cement in general use around the world because it is a basic ingredient of concrete, mortar, stucco and most non-specialty grout. It is a fine powder produced by grinding Portland cement clinker, comprised of dicalcium silicate, tricalcium silicate, tricalcium aluminate, and tetracalcium aluminoferrite, with the addition of forms of calcium sulfate. 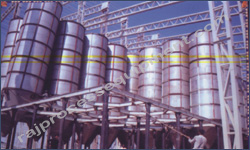 Different types of portland cements are created based on the use and chemical and physical properties desired. Limestone rock is the principal raw material, the first step after quarrying in the processes is the primary crushing. Mountains of rock are fed through crushers capable of handling pieces as large as an oil drum. The next step in the process is to grind the above particles to a size of 90 microns or less which is done in a raw mill. Next, the fine powder is heated as it passes through the Pre-Heater Tower into a large kiln, which is large in diameter. In the kiln, the powder is heated to 1500 degrees Celsius. This creates a new product, called clinked, Clinker is discharged red-hot from the lower end of the kiln and generally is brought down to handling temperature in Grate coolers. The heated air from the coolers is returned to the kilns, a process that saves fuel and increases burning efficiency. Pre-calciner suitable to work with alternative fuels. Less wearing parts in rotary kiln. Low Maintenance & simple operation. Lead time for project is short. Greater efficiency & saving in Power Consumption. Convenient and reliable control of the production process. 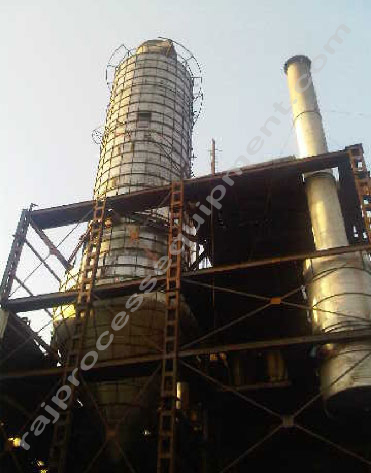 Suitable project site selection & raw material testing. Pollution control and environment engineering.